It's that time of year again! At our celebratory dinner on 24 May, we'll be presenting our annual Public Education Awards. Do you have a colleague or friend who deserves recognition for their contribution to public education? The Public Education Award, given to an individual or group of AEU ACT members to acknowledge and foster the work they do in prmoting public education within schools/TAFE and the wider community, and in their personal lives. 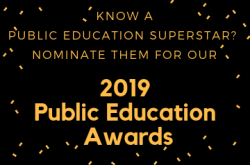 The Friend of Public Education Award, given to an individual or group from the community, such as parents or volunteers, not eligible to be an AEU member, to acknowledge and foster the work they do in promoting public education. The Reconciliation Award, given to an AEU member (or person ineligble to be a member) working with an Aboriginal and Torres Strait Islander Education program within public education. This award acknowledges and fosters the work of AEU members in promoting Reconciliation within public schools/TAFEs and the wider community. Click here to view and download a nomination form. Be sure to get your nominations back to our office by Friday 10 May.